DARWINmachine, an American based custom computer manufacturer present a new product. Great White SHK979 is a statement in elegant simplicity. This computer is also available with EK Water Blocks liquid cooling solution allowing for even further noise reduction and to enhance the overclocking potential of this elegant system. Combining DARWINmachine’s open aluminum heatsink design with liquid cooling, the GreatWhite is one insanely cool PC chassis for the serious overclocker. The Awesome GreatWhite starts out as a single sheet of aircraft grade aluminum – 5 times thicker than that of a standard PC enclosure -CNC milled and meticulously handcrafted with stainless steel hardware and DARWINmachine’s signature white Ecoresin. The GreatWhite is as elegantly beautiful as it is functional, as all components are easily accessible for rapid upgradeability. 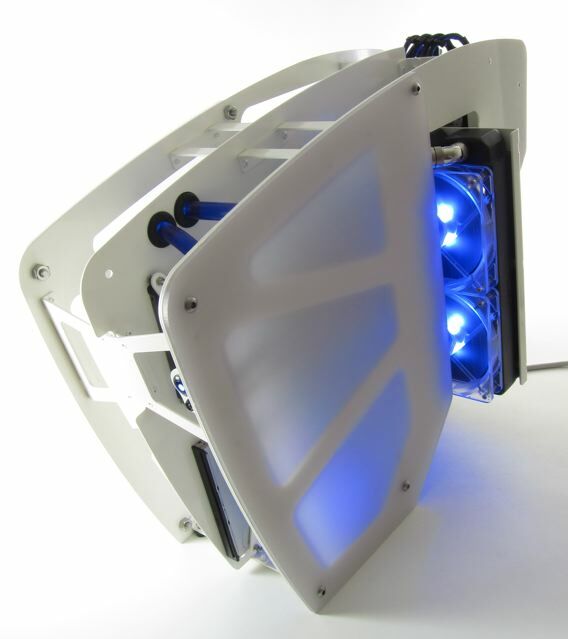 DARWINmachine Great White SHK979 is available for purchase through DARWINmachine website.